Washington, April 4: Poor diet leads to hundreds of deaths in India annually, according to a Lancet study which found that globally one in five people die due to the lack of optimal amounts of food and nutrients on their plates. 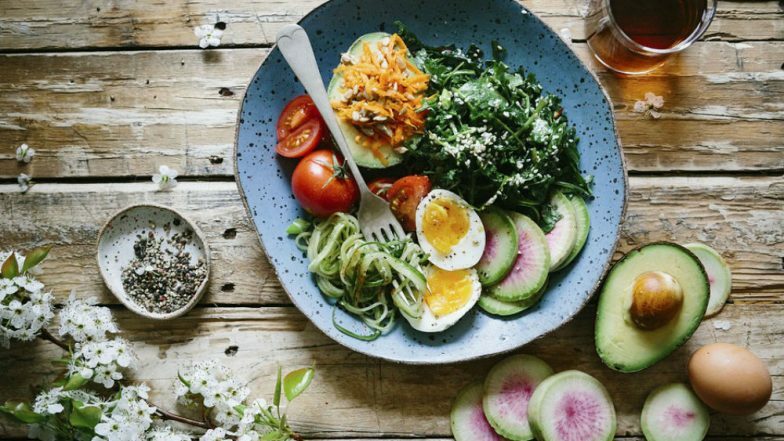 The report, which tracked trends in consumption of 15 dietary factors from 1990 to 2017 in 195 countries, showed that almost every region of the world could benefit from rebalancing their diets. The study estimates that one in five deaths globally -- equivalent to 11 million deaths -- are associated with poor diet, and diet contributes to a range of chronic diseases in people around the world. Fruit Seeds Health Benefits: Mango, Jamun, Jackfruit+ 3 Other Kernels That Are Super Nutritional!. In 2017, more deaths were caused by diets with too low amounts of foods such as whole grains, fruit, nuts and seeds than by diets with high levels of foods like trans fats, sugary drinks, and high levels of red and processed meats. Low intake of whole grains -- below 125 grammes per day -- was the leading dietary risk factor for death and disease in India, the US, Brazil, Pakistan, Nigeria, Russia, Egypt, Germany, Iran, and Turkey. In Bangladesh, low intake of fruits -- below 250 grammes per day -- was the leading dietary risk. In 2017, the countries with the lowest rates of diet-related deaths were Israel, France, Spain, Japan, and Andorra. India ranked 118th with 310 deaths per 100,000 people. The UK ranked 23rd (127 deaths per 100,000), and the US ranked 43rd (171 deaths per 100,000) after Rwanda and Nigeria (41st and 42nd). China ranked 140th, with 350 deaths per 100,000 people, researchers said in a statement. The findings highlight the urgent need for coordinated global efforts to improve diet, through collaboration with various sections of the food system and policies that drive balanced diets. "This study affirms what many have thought for several years -- that poor diet is responsible for more deaths than any other risk factor in the world," said Christopher Murray, at University of Washington in the US. Health Benefits of Quinoa: Why this High-Protein Superfood is Important for Vegans & Vegetarians. "While sodium, sugar, and fat have been the focus of policy debates over the past two decades, our assessment suggests the leading dietary risk factors are high intake of sodium, or low intake of healthy foods, such as whole grains, fruit, nuts and seeds, and vegetables," said Murray. The study evaluated the consumption of major foods and nutrients across 195 countries and quantified the impact of poor diets on death and disease from non-communicable diseases (specifically cancers, cardiovascular diseases, and diabetes). It tracked trends between 1990 and 2017. Overall in 2017, an estimated 11 million deaths were attributable to poor diet. Diets high in sodium, low in whole grains, and low in fruit together accounted for more than half of all diet-related deaths globally in 2017. The causes of these deaths included 10 million deaths from cardiovascular disease, 913,000 cancer deaths, and almost 339,000 deaths from type 2 diabetes. Deaths related to diet have increased from 8 million in 1990, largely due to increases in the population and population ageing.